Finally, my wishes came true in January of 1991 despite my friends concern that I was going to Guatemala to study how to be a communist guerrilla fighter. I arrived in Guatemala City from Ecuador in the midst of the civil war, violent crime and kidnappings. Little did my friends know that I was going there because I was totally convinced that the best fight against enemies of freedom was through education in free market principles. Some of my friends were concerned that I was going there out of idealistic pursuit of ideas, and not because it was the best university available. I had to admit that I myself was not sure if the University was an indoctrination camp and not a real university. These worries were quickly dissipated once I stepped foot on campus. Its reputation as a stellar institution of higher learning is rivaled by few. When I first met Muso I was pleasantly surprised at how warm he and his family were. I was invited to spend many weekends at their Amatitlán home. Muso was an engineer by trade, although he knew as much about economics despite not studying it formally. He also shared with me (I learned over the years) a fascination for electronic gadgets and a kind of natural ability to learn how to use them quickly. Of all his towering achievements this little fact might seem unimportant, but to me it revealed an attitude of defying usual expectations and doing things that other people thought impossible. 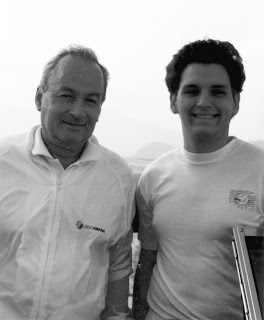 This trait was apparent when he founded one of the oldest think tanks in Latin America, a university in the middle of one of the longest and most devastating civil wars in the Americas, and a lifetime of entrepreneurial and academic success. The icing was when he learned to fly helicopters at nearly 80 years old. Unbelievable…except to those who knew him personally. his waist because he was suffering from lower back pain. Upon returning to his house he told me to try to tie up the boat at the pier. I have never been particularly athletic and despite my youth I was afraid of falling into the water. Seeing that I was not able to do it, he told me, "let me show you." He jumped from the boat to the pier like a teenager, and proceeded to pull the boat and tie it up to the pier. Needless to say I still feel embarrassed at the fact that a sexagenarian was able to teach me that lesson. Over the years, until the last time I saw him in at a Liberty fund Colloquium held in Guatemala in November of 2008, he looked pretty much the same - not much different from those pictures 19 years ago. Always with that funny grin like a kid about to do something naughty, very clever despite of starting to suffer the effects of the chemotherapy for his cancer, and despite being sometimes forgetful last time I saw him, always very witty and clever. Throughout my five years in Guatemala I went to Muso's home on weekends and he and Olga always complained to me and my father that I was not a more frequent visitor. It was a home away from home. It was such a warm and welcoming environment for a young man away from his home country. For that I am forever grateful. A lot of times I felt a little shy as if I was abusing their generosity. I felt a certain reverential fear when in Muso's presence. He was always very open and talking with him challenged me to be extremely focused all the time because I was speaking to a towering figure. though I was visiting my grandparents, a certain joy like seeing family. I use to feel a little jealous of my brothers and sister who were able to regularly visit the Ayau family gatherings. Even worst jealous of others,because when seeing him I was not able to talk in that familial environment that I had with him early on. Muso had become like a rock star and many people wanted his attention. The legend was reaching the pinnacle of his life and everybody wanted a piece of him. Despite all that I knew that whenever he saw me he would come and ask me how things were, about my family and how important it was for me to lose weight (I was so much thinner when I met him in Guatemala!) I thank him because he was never judgmental in doing so but he was seriously concerned about me. I reflect on this today as I am writing these random recollections because upon learning of his death I could not at first put together in words what I felt towards the hero of my childhood, the hero that put me on the path of advocacy with a cartoon book, the friend that opened the doors of his home and family to me and my family and was always concerned about my future like a grandfather. I can thank him for the fact that I studied at Francisco Marroquín, a university where you go to learn about freedom, but also and institution that strives for excellence in education and that focuses on the search for truth and independence. I owe to him the fact that I do what I do at Atlas where I am committed to the cause of liberty. Lots of people I’m sure will be able to better put in words his lifetime of achievements, but I wanted to pay tribute to the man, the hero, the grandfather that he was to me. I know that I am not alone, Muso and the Ayau family were very generous to all people that came through their lives and many will have similar recollections. He might be gone but the spirit and legacy left to those of us that try to engage in teaching and promoting liberty will be with us forever.